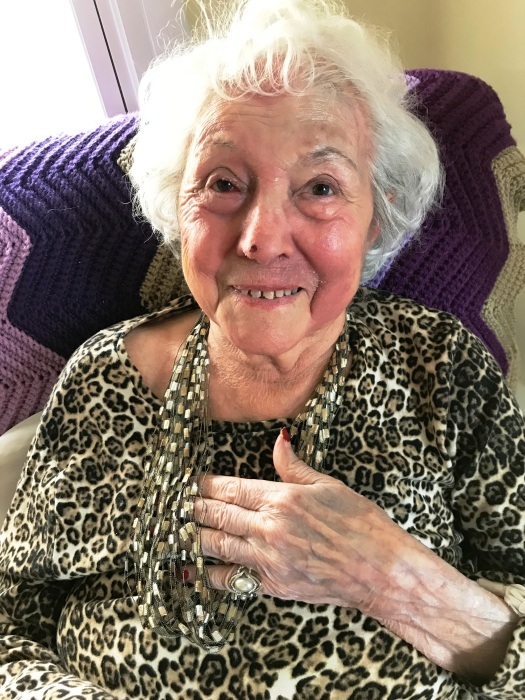 Obituary for Esther Gloria (Angelotti) McCarthy | George C. Lima Funeral Home, Inc.
Esther Gloria (Angelotti) McCarthy, 97, of Sherry Avenue passed away peacefully surrounded by her family on January 21, 2019 at Silver Creek Manor. She was the beloved wife of the late Raoul G. “Mac” McCarthy. Born in Cranston, she was the daughter of the late Adamo and Giuseppina (Cerra) Angelotti. Esther was a bookkeeper at Coro Jewelry in Providence, Arlington Service Center and her husband’s business Duo Services. She was a top performing Avon Representative for many years. Esther and Mac raised their family in Warren. She enjoyed many activities including square dancing, bowling, gardening, playing cards, and loved spending time with her grandchildren and family. She was also an avid scrabble player, loved watching Wheel of Fortune and was especially fond of her senior companion Bunny and her four legged friends Lady and Sweet Pea. A special thank you to Silver Creek Manor, Visiting Nurse Home & Hospice and Beacon Hospice for their loving care. Esther is survived by her loving daughters, Cynthia McCarthy and her husband Ken Januario of Bristol, Janice Cotta and her husband Robert W. Cotta of Rotonda West FL; grandchildren Robert W. Cotta, Jr, Brooke L. Cotta and great granddaughter Elliot K. Cotta. She was the sister of the late Anthony, Albert, Vincent, and Adam Angelotti, Anna Nash, Concetta Pazienza, Mary Valetta and Camilla “Millie” DiCaprio. Her funeral services will be held Saturday, January 26th, 11 AM from the George Lima Funeral Home 367 High Street with a Mass of Christian Burial, 12 PM at St. Mary of the Bay Church, 645 Main Street Warren. Burial will follow in St. Mary of the Bay Parish Cemetery. In lieu of flowers, donations in Esther’s memory can be made to: Silver Creek Manor Activities Dept, 7 Creek Lane, Bristol RI 02809.